Starred Review. What perfect timing for this optimistic, uplifting debut novel (and maiden publication of Amy Einhorn’s new imprint) set during the nascent civil rights movement in Jackson, Miss., where black women were trusted to raise white children but not to polish the household silver. Eugenia Skeeter Phelan is just home from college in 1962, and, anxious to become a writer, is advised to hone her chops by writing about what disturbs you. The budding social activist begins to collect the stories of the black women on whom the country club sets relies and mistrusts enlisting the help of Aibileen, a maid who’s raised 17 children, and Aibileen’s best friend Minny, who’s found herself unemployed more than a few times after mouthing off to her white employers. The book Skeeter puts together based on their stories is scathing and shocking, bringing pride and hope to the black community, while giving Skeeter the courage to break down her personal boundaries and pursue her dreams. Assured and layered, full of heart and history, this one has bestseller written all over it. 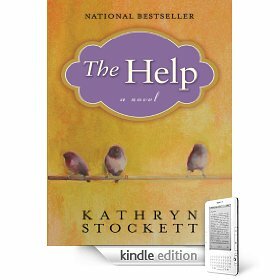 There aren’t enough positive, glowing and loving words that I’m aware of describe Kathryn Stockett’s touching, eye-opening, powerful and memorable novel, The Help. And that’s my review! Just kidding. But seriously, I loved, love and will always recommend The Help to anyone looking for a good book to sink themselves into. The story is deeply involved with wonderfully detailed character development. As you read The Help you get to know stong and weak women alike. Aibileen and Minny are two housekeepers, child raisers and in Minny’s case, psychologists/mother to her employer. Miss Skeeter is the young lady who brings their stories to light, or more specifically to paper. She is a graduate from Ole Miss and wishes to be a writer and to live in New York City. So after an idea of a book partly supported by a publicist in the Big Apple, Miss Skeeter begins secretly meeting with Aibileen, Minny and a few other maids in their hometown of Jackson, MS to get their stories of working in the family homes of white women on paper. The other characters we get to know (like them or not) are the white female employers who are, for the most part, a disturbing reflection of the time the story is set in. 1962 Mississippi and the beginnings of the Civil Rights movement is where The Help is set. I’ll tell you what, this book has a villain like I haven’t read in a very long time. If they made a film adaptation of The Help I would be very interested in seeing who is cast to play Miss Hilly. I HATED her and all her beliefs. Miss Celia (Minny’s boss) was fun, hopeless and the most alone of all the characters but still was one of my favorites. The Help is full of great twists, edge of your seat suspense and heartbreaking moments as well as laugh/gasp out loud ones. The topics will make you think and if they don’t then this isn’t the book for you. Though The Help is fiction, I would call it historical fiction. Author Kathryn Stockett grew up in Mississippi and is said to have based a few of the characters on her own family’s maid and Stockett has written her story through and around true historical events in this nation’s history. We just celebrated Martin Luther King Jr.’s birthday and are getting closer and closer to February which is Black History Month. Please take a few days to read this gem of a book and reflect on where our country has come from and where we are going. At one point in The Help, Miss Skeeter catches a brief listen of Bob Dylan’s “Times, They Are A Changin’.” Here is that song followed by Sam Cooke’s amazing tune, “A Change Is Gonna Come” performed by Lauren Hill & The Fugees.